Caroline Bookbinder: Give All the Books Away! This is definitely one of my STRENGTHS as a book maniac - I may be horrendously bad at bringing too many INTO the house, but I'm pretty good at getting them back OUT again once I've read them. Even the most awesomely brilliant book tends to get maybe 2 weeks post-reading to sit on my shelf and stew, and if it's not singing to me after that time, out it goes. This means I have a small collection of 'must-keeps' - not always the best of the best books, but ones that make me feel happy and have good re-read value - and the rest can be happily released into the wilderness (or our bookshop, as it's better known). I'm quite lucky I suppose - if I wasn't happy to do this I'd probably have died under toppling heap of paperbacks long ago! 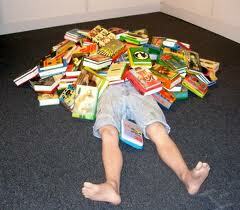 I do this too and am still drowning in books! My friends and family have come to rely on me to provide them with a "curated for them" collection of books!